To become a better street photographers we need to learn from the masters. The conceptual artist Vuk Vidor has a great poster called Art History. It got me thinking about what different street photographers are known for. Sometimes it’s not always the thing they wish they were known for. I’ve put together a poster of about who’s who in the world of street photography in 2011. There might be a few names you don’t know and a lot that you already do. For clarity, I’m not asserting any copyright over the image, the names or the design. Other than that, if you re-use the design yourself, it can’t be for commercial purposes. I’m planning to revise it for the end of 2011 and do another one in 2012. I’ll update the pdf as well, so do help out by commenting. Have I missed anyone out? Have I misrepresented anyone? What are people really known for and who moved you in 2011? Too funny that you picked bulldogs for Elliot Erwitt to own – I TOTALLY agree! 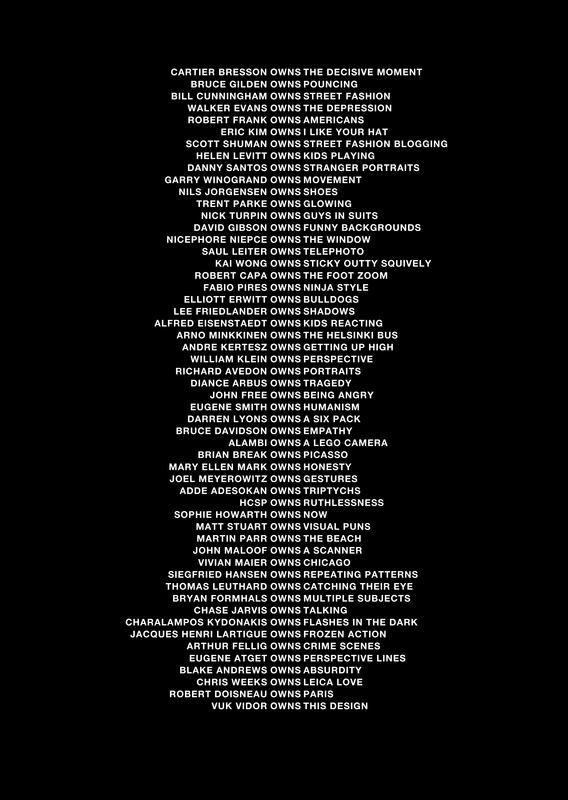 Quite a few names to check out though, I yet have to expand my horizon further. Jamel Shabazz owns uptown NYC. the Eric Kim entry: lol.